Violence in Egypt has taken a dark turn for sectarianism as more than 45 churches and Coptic institutions were torched or stormed across the country. 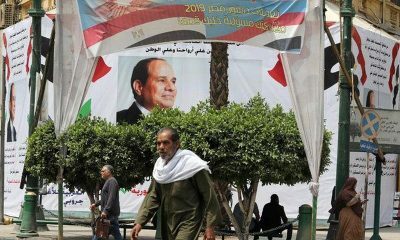 The wave of attacks against Copts and their houses of worship, businesses, schools and homes came as Egypt’s security forces dispersed two large pro-Morsi sit-ins in Cairo. 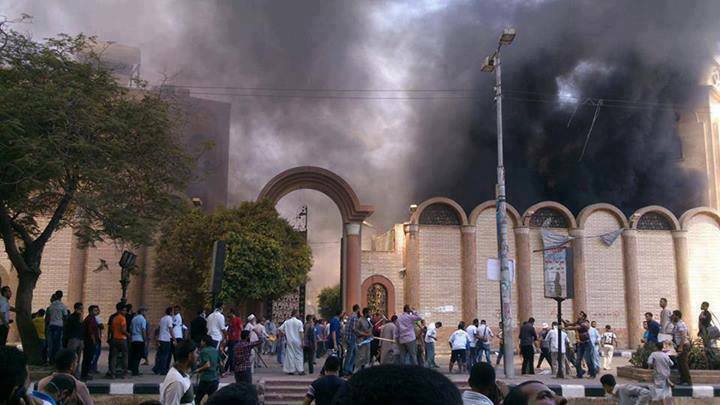 In cities across Egypt, from Sohag and Minya to Cairo and Assiut, Islamists took to the streets attacking churches. In one case in Minya, a Coptic man and his wife were detained before being killed by armed individuals. 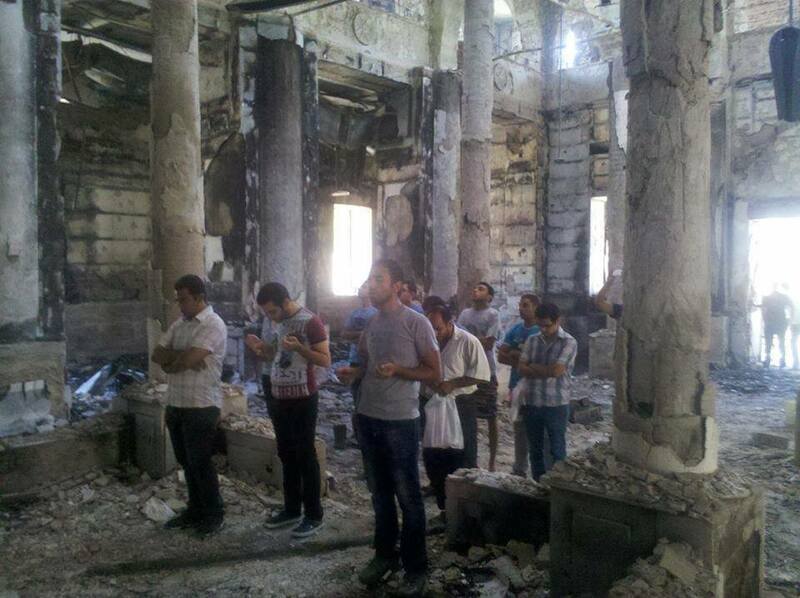 In one incident, Islamists torched parts of one of Egypt’s oldest churches that was reportedly built in the 4th Century. In Alexandria, others expressed disbelief at the actions of these Islamists that have often been identified by reports as Morsi supporters. 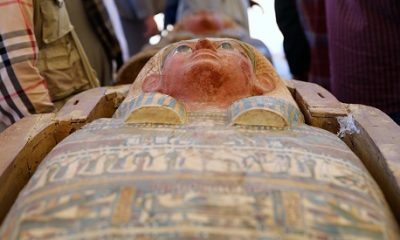 The violence against Copts in Egypt comes as the official death toll from violence across the country has reached 525, with at least 3200 injured. 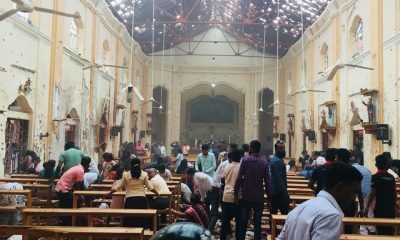 In a public message on Facebook, the Muslim Brotherhood’s political arm, the Freedom and Justice Party, said that its supporters had been behind the torching of Churches. 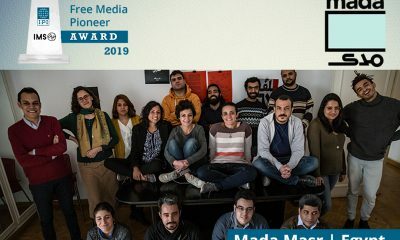 “The Pope participated in the toppling of the first elected Islamist President…and in sabotage, destruction, and violence…that led to the fall of the Islamist President,” said the Freedom and Justice’s official Facebook page of Helwan. “The Pope is trying to remove the Islamic identity in Egypt…and after all this you ask why Churches are being torched…for every action there is a consequence,” added the Facebook page. 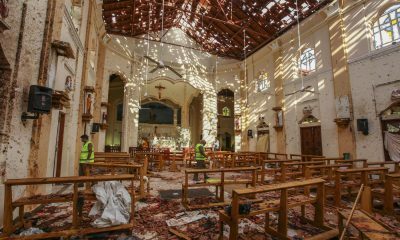 In response to the destruction of churches, Egypt’s Minister of Defense and Military Chief, Abdel Fattah Al-Sissi, authorized the Armed Forces’ engineering unit and personnel to rebuild and restore all churches and Coptic institutions that were attacked by Islamists. 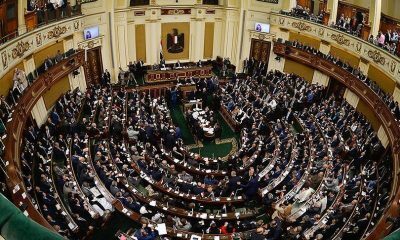 Egypt’s Cabinet and Prime Minister also declared that they condemn all acts of violence against Copts, and that all necessary action will be taken to ensure the security of Copts. The statement by the cabinet came before the Ministry of Interior announced that police forces have been authorized to use live ammunition against any individuals that attack members of Egypt’s security forces, civilians, or any state institutions. However, despite condemnations from the government, Copts in Egypt and abroad are reeling. 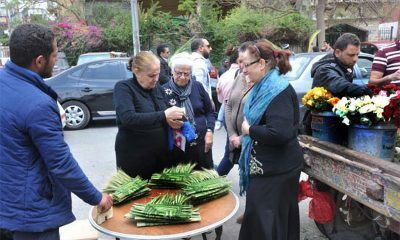 In several countries, including Australia, USA, and the United Kingdom, Coptic communities will be holding prayers in solidarity with Copts in Egypt. 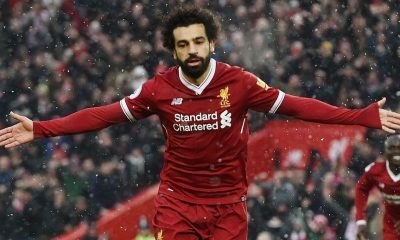 Leaders of these Coptic communities have also been contacting international governments to ensure that the violence against Christians in Egypt is condemned and that greater action is taken to pressure all sides to ensure the protection of Copts. 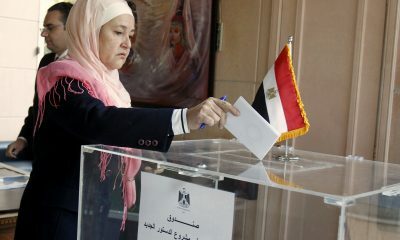 In solidarity with the Copts, many Muslims have expressed their concern and disgust at the actions by the Muslim Brotherhood. 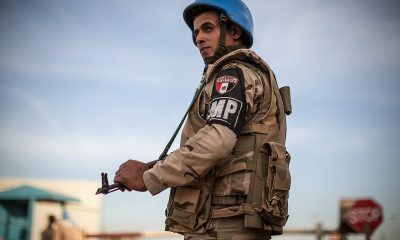 “The Qur’an tells us to protect our Christian brothers and their churches,” said Ahmed Mohammed, 26, from Assiut. 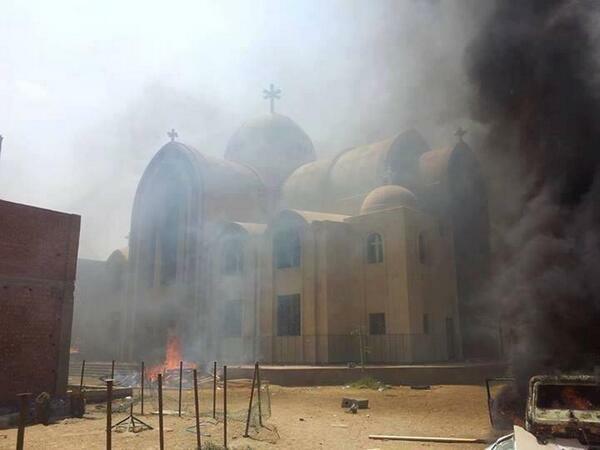 “These people [attacking churches and Copts] are not Muslim and they do not know what Islam is. 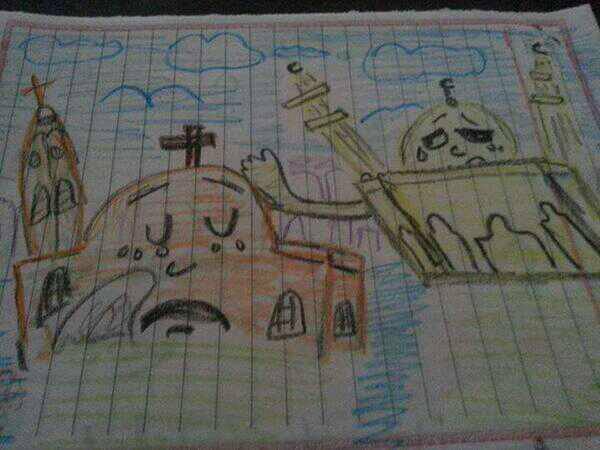 In a widely shared image on Twitter and Facebook, one unidentified schoolgirl drew an innocent drawing showing her support for Copts. The image shows a crying Mosque giving a hand to a sobbing Church. 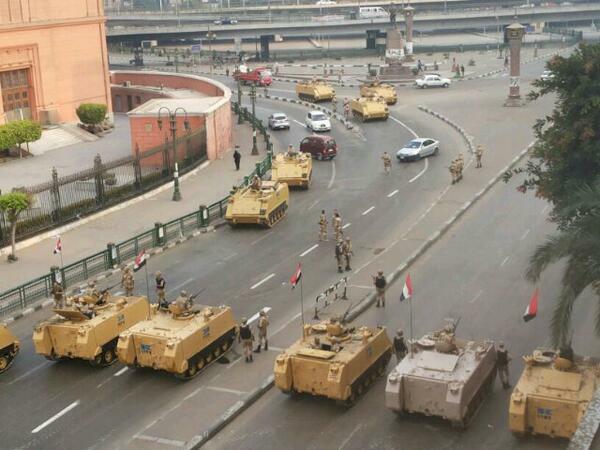 As of today, security forces have not intensified their presence around Egypt’s churches. With at least 46 pro-Morsi and Islamist marches planned to Ramsees Square in Cairo, and countless others planned across Egypt, violence is likely to flare as anger rises in Egypt.